Are you Team Alien or Team Predator? Do you prefer the Ridley Scott/James Cameron Alien films of the ’70s and ’80s or are you a bigger fan of the Arnold Schwarzenegger Predator film? Maybe you are a fan of survival horror? Or, just possibly, perhaps you’re simply a fan of all of the above? Whatever your particular poison, the standout Atari Jaguar title, Alien vs. Predator, has it all. This incarnation of the Alien vs Predator game (there are other, unrelated AvP games available on the SNES as well as the arcade) was developed by Rebellion Developments and published by Atari Corp in 1994. Rebellion used the Alien vs Predator comic books as source material along with the respective motion pictures to create a completely unique first person/dungeon crawler game. As a result of this version of AvP being different than any other, it is often cited as one of the key reasons to own an Atari Jaguar. It is a rare exclusive for the Jaguar that is not only playable, but very well designed and in many ways, an exceptional game. The question that seems to follow AvP around these days is whether or not it holds up. Since AvP is played in a first person shooter style, it suffers when played in hindsight due to modern advancements in the genre, most notably the lack of easy strafing ability useful in keeping enemies in your sights as you move. Instead of two analog thumbsticks, you either had to use the keypad (awkward) to strafe or else not strafe at all, which is how I play the game. Considering AvP was released in 1994, a time when 3-D graphics were still in their infancy, the most important thing to judge AvP on is its fun factor. Right out of the gate, Alien vs Predator shows how exceptional it is with menu screen music that sets the eerie and foreboding tone. If you then let the menu screen run, you are treated to the game’s story, complete with stills of how the aliens and predators arrived on your training base ship. When you’re ready to start a game, you are given the option of choosing one of three characters. You can play the game as an alien, a predator, or a marine. Each character comes with their own scenario, so you essentially have three different games to play on one cartridge. AvP’s graphics are primarily digitized environments with some 3-D mapping to help flesh out the details. Overall, the in-game graphics are well rendered and don’t suffer from severe pixelation when you’re close to objects or enemies. There is no in-game music, but many of the sound effects are either taken directly from the films or they are faithfully recreated. The lack of in-game music really puts you in the shoes (hypothetically speaking of course, since aliens and predators wear no shoes) of the character you’re playing, and I think that even if the choice to not include music was made due to memory limitations, it was a wise decision. The lack of in game music sets a minimalist tone and the ambient sounds lull you into complacency before the shrieks and taunts of the aliens and predators pierce the near silence, jarring you back into the reality of your surroundings. AvP offers plenty of scares as well. There are many instances throughout the game where a lack of music provides a (false) sense of safety until you turn around and see an alien screeching at you. The number of times I literally jumped in my seat during these instances are uncountable. There are also alien face huggers that hatch out of pods and the sound of that pod hatching can get your pulse racing. Predators, on the other hand, tend to make their presence known by making noises prior to un-cloaking. You may hear their clicking sound or you may hear their hair-raising whispers (“anytime”) that never fail to unnerve. This game is legitimately creepy in the marine scenario, and for me that’s a huge draw. The marine scenario is the primary and most difficult scenario in Alien vs Predator. You are a marine, waking up in the brig from cryogenic sleep having been court-marshalled for striking a superior. You awake without weapons and zero level security clearance. You begin by wandering around, quickly realizing as you see dead soldier bodies laying all over the ground, that your ship is under attack. Your only goal is survival and escape. There isn’t a single human alive on the ship that has been completely overrun by both aliens and to a lesser extent, predators. You can’t set off the self-destruct sequence and escape without weapons and the highest of security card clearance, objects that you must find on the dead bodies strewn about the 5 sublevels of the ship. You start with a simple shotgun and can eventually upgrade to a pulse rifle, a flamethrower and a smartgun. Finding and utilizing the motion tracker to give you an idea when enemies are near in combination with pulling up the map onto your HUD (heads-up display) to keep track of where you’re going, are the best techniques for survival. Escaping is far from easy, however, so here are some additional keys to success. The game rewards you for lengthy playtime as enemies only re-spawn if you turn the game off / re-start. Sublevel 3 is the place to go for health and weapons re-charges until you gain access to the armoury. Until you get the smartgun, run from predators as often as you can. Avoid killing aliens in narrow hallways to keep you from having to run through their acidic blood. Save your game in more than one cartridge save spot just in case you find yourself in a situation you can’t get out of alive, allowing you to re-start using a different save spot and learn from your mistakes. The marine scenario can be frustrating at times due to its difficulty. The sublevels are all maze-like and can be confusing and easy to get lost in, even with the map function pulled up for use. You must spend time navigating the airducts to get from point A to point B if you don’t have proper clearance or if the doors are jammed. These airduct sequences can be quite harrowing if you get lost and you know there are aliens crawling around after you, trying to make your life miserable (and short). If you make a mistake, such as saving your game in a spot with very little health, it’s feasible that you could re-start your game only to see an alien immediately in front of you that kills you 2 seconds later. It’s always best to save your game in an elevator where enemies can’t re-spawn, and ideally, with enough health to withstand a hit or two just in case. Also frustrating is how slow it can feel when you’re trying to turn around, either to confront an enemy that is attacking you from behind or while trying to close a door behind you. This is due to some frame rate issues. AvP is absolutely effective in making you feel under-powered and over matched for most of the game. Even when you have the strongest weapon, the smartgun, you run out of ammo so quickly that saving it for worst case scenarios is probably the best option. If AvP only offered the marine scenario, it would still be an amazing game. However, there are still two more scenarios to explore! The plot of the Alien scenario is presented to you on the opening screen. The Alien Queen has been kidnapped! You are a member of the alien herd and your sole mission is to save the Queen being held prisoner on the Predator’s ship. Her survival is the only thing that matters. Your own life is expendable. In spite of the fact that the predators hold the Queen hostage, your primary antagonists throughout the game are actually the marines roaming around the ship who are also trying to eliminate your species. It only takes a few blasts from the marine’s weapons to wipe your characters out, and you cannot regain energy at any point, so you must use your impressive speed to either attack quickly or run. If you choose to attack, your alien has 3 attack options at its disposal and all must be carried out at close range. You have the claw, the tail and the jaw attacks, each using one of the 3 controller buttons to employ. The jaw attack offers an instant death to the marines but the claw and tail take more than one strike. Tail attacks are best for stunning a marine so you can use the jaw or claw attack to finish them off. Each alien attack has its own power meter that depletes after the attack is used, but will automatically regenerate once you stop attacking. I personally never ran into a situation where I had depleted an attack, but I suppose if you go on the offensive instead of defensive mode, this might become a problem. The cocoon technique is the unique gameplay quirk used to create new aliens, since it’s a given that you will ultimately die and die often. You cocoon a marine by using a three button combination of melee attacks, which is a bit awkward to pull off at first attempt. You have to first strike a marine using your claw, then swipe him with your tail, then use the claw on him again. Once you’ve been given the “cocoon marine” notification, you then simply walk over him to hear the telltale signs of a slimy, grotesque cocooning taking place. As this takes a bit of time to pull off, it’s best to do with only one marine in an area as you’ll get wasted by other marines in the time it will take you to cocoon the one you’re targeting. The outcome of a proper cocooning is that you will now have one alien life in reserve, once it has fully gestated. After your first alien inevitably perishes, the fully gestated alien that has been cocooned inside the marine will then burst forth (you aren’t treated to the graphic image of an alien being born from the body of the marine, sorry) and you continue playing from the location of that alien. If you haven’t figured it out yet, this means you’ll be doing quite a bit of backtracking throughout this mission. You can perform the cocooning technique up to the three times but you definitely do NOT want to have all 3 alien reserves in the same general location. Think of your alien reserves as “save points”. You want to keep cocooning marines as you advance to ensure that you ultimately don’t have to backtrack all the way back to the beginning. The alien mission itself isn’t overly long. You start from your own ship on sublevel 5 and must find your way up to the predator ship, where the Queen is being held on sublevel 1. Unlike marines and predators, you cannot use elevators to move from sublevel to sublevel so the air ducts are your only option. Thankfully, marines do not crawl around the air ducts in this mission, so these transition locations are good places to save your game or wait out the gestation period of a cocooned alien. Once you reach sublevel 1 and the predator ship, you finally meet up with the predators themselves. As expected, they are tougher to kill than marines, so having cocooned marines just outside the predator ship is a useful technique to finishing this scenario. Once you’ve reached the ship’s bow, you’ll see the Queen held behind a force field. Simply destroy the force field boxes surrounding her and the Queen and your entire species are safe from extinction. Of the 3 scenarios the game has to offer, the alien scenario is my least favorite. I do not like that I only have close range attacks when everyone else can attack me from a distance. I also do not like how “weak” my alien is and how easy it is for me to die. The cocooning technique is a bit difficult to pull of at first due to the cumbersome 3 button scheme. I can’t tell you how many times I was near death and desperate to cocoon a marine only to realize I wasn’t properly pulling the technique off. To get a proper swing of your tail you have to hold the C-button to extend it all the way, and I was only tapping the button, thus my tail wasn’t making contact with the marine. Ugh! This scenario is not horrible once you get a hang of the basic techniques for survival, but it certainly can be frustrating at first and a bit grating to repeat your steps over and over. Many times, starting over from square one is the only way to success if you’ve saved your game with an alien that has very little energy left and likely cannot cocoon a marine without dying first. However, once you have the maps and routes figured out, you can complete the alien scenario very quickly. For the Predator Scenario, you take on the role of a youthful warrior, responding to Camp Golgotha’s distress signal, only to find that it has been overtaken by one the strongest and most treasured species that a hunter such as yourself could ever hope to conquer, the Xenomorphs! Your mission is to hunt and take down this savage species’ Queen, and do so with the highest honor. You start the game off with a low level of honor points which can only be increased by hunting and killing other species. There are two species available to hunt on Camp Golgotha, the Alien and Human species. As a Predator, you have the ability to cloak yourself and become invisible to the human eye. While cloaked, you can kill any species you come across, but doing so will reduce your honor points as hunting while invisible is considered cowardly. The human’s bodies are weak but their weapons can cause damage from a distance so the best technique in taking out the human marines is to stay cloaked until you are in a position to attack, uncloak yourself and quickly strike. Once you are uncloaked, the marines take quick notice of your presence and begin shooting, so a single, quick strike is all that is needed to end their lives and build up honor points. The cloaking mechanism can be enacted by pressing the option button on the Jaguar controller, and once you’ve cloaked you can cycle through the various filters using the keypad. There are 5 different filters to choose from, ranging from visually grotesque to merely adequate. Unfortunately, the Jaguar doesn’t do a great job with any of these filters, but a couple of them allow for better vision than others. Pick and choose the one(s) that work best for you and stick to them. I tended to only cloak when I was entering new rooms as that is typically where marines were wandering around. As soon as I would dispatch of them, I would uncloak for good until I reached a new room and repeat the process. Once you reach the alien ship at the end of the game, where your ultimate challenge against the Queen awaits, there is no need to cloak yourself at all since aliens can see you regardless. Since you’re visible to aliens whether cloaked or not, using stealth tactics does not work against this physically advanced species. As with the marine scenario, the alien facehuggers will burst out of their cocoons to attack and drain your energy, so take them out first if you can. If they latch onto you, press left and right rapidly to shake them off, thus killing them in the process. Your predator is not immune to the damage that the alien’s acidic blood presents, but overall you are quite strong. It takes significant and repeat damage to drain your warrior’s health bar. Unlike in the alien scenario, you can replenish your health through the use of food and med-packs scattered around the camp, and unlike the marine scenario, you can carry extra health rations with you throughout your hunt. So stock up on the sublevels that are heavy with med-packs and refill your energy with your back-up supply, noted on the predator’s HUD, before picking up additional rations. As previously mentioned, the ultimate goal of the predator scenario is to kill the alien Queen, achieving the highest honor for your young warrior. The Queen will not go down easily and the only weapon you have to start the game is your melee (hand to hand) attack. This is fine for killing marines, but not so great for killing aliens, and is especially ineffective against the alien Queen as it requires you to be up close and personal in order to kill them, which inevitably leads to acid splash. Your best option is to kill marines using the stealth technique previously described until you build up enough honor points to earn new, longer range weapons. In general, once a new weapon is earned, the game automatically equips it, but if you want to go back to a less powerful weapon at any time, you can use the Jaguar controller keypad to switch between them. The first weapon you’ll earn is the combi-stick after gaining 150,000 honor points, which is stronger than your melee attack and allows you to be slightly further away from enemies in order to attack. The next weapon earned, at 350,000 honor points, is the smart disk, which allows for ranged attacks. This is the perfect weapon for alien disposal. The smart disk does require precision and proper lining up of your target before using. If an alien is running towards you in an erratic pattern, you may miss several times before finally making contact, which can be frustrating if you’re trying not to take damage. Once you gain 750,000 honor points, you earn the shoulder cannon, the strongest weapon in the game. While this weapon can easily take out hordes of marines and aliens with one or two shots, its biggest drawback is that it can also damage you if discharged in close quarters. Similar to the alien scenario, each predator weapon has its own gauge that depletes as you use it and replenishes when not in use, so you don’t have to worry about ammunition. The shoulder cannon is the weapon you’ll want to use against the Queen, as any other weapon simply isn’t strong enough to take her down before she slaps you into the next galaxy. Overall, the predator scenario isn’t overly challenging as your character is quite strong and it takes several hits from a marine’s weapons to do enough damage to seriously concern you. There will be large, open areas with quite a number of marines wandering around. If you choose to attack the marines in big, open areas, be aware that, once you expose yourself, they begin firing from all sides and even cloaking yourself may no longer work. It’s always best to attack one or two marines at a time instead of in large numbers. As mentioned, killing an enemy while cloaked will take away hard-earned honor points, so be diligent about uncloaking for each and every kill you rack up. Keep that finger hovered over the option button so you can uncloak at the first sign of an alien or right before you attack a marine you’ve sneaked up on. Reaching the alien ship and careening along its corridors was a harrowing experience in the marine scenario, but it isn’t nearly as nerve-wracking in the predator scenario. This is due to the fact that you are much stronger than the aliens since the alien ship is littered with med-packs to refill any energy lost during battle. I never once felt concerned that I couldn’t reach the alien Queen’s hive unscathed. In my opinion, the predator scenario is the easiest of the three scenarios that this excellent game offers. After playing through all three scenarios (marine, alien, predator), I can say that the marine scenario makes this game what it is. It is by far the meatiest and most difficult scenario offered and is the most rewarding once completed. Sure, it can also be the most frustrating due to its difficulty. Pushing through frustrating sections of a video game only to come out the other side, having conquered it leads to not only a huge sigh of relief, but also a true sense of accomplishment, something that was missing when I completed the alien and predator scenarios. Only marines and predators utilize weapons in AvP, so I am going to choose the smartgun from the marine scenario as my favorite weapon. Yes, you don’t get this all powerful gun until much later in the campaign, so you don’t have much time with it, but since you spend so much of the marine scenario in fear of the predators and their taunts, its nice when you finally have a neutralizing weapon that you know can dispatch of them quickly. Alien vs Predator is not a perfect game. There are periodic issues with hit detection, frame rates, and environments and enemies aren’t quite as pretty up-close. However, I found none of these factors to be major detractors from what I consider an excellent, adventurous title. I still had hours and hours of fun with this game, exploring the sublevels, blasting enemies and basically scaring myself by playing it with the lights off, with only the ambient sounds and occasional alien screech and predator taunt to keep me company. 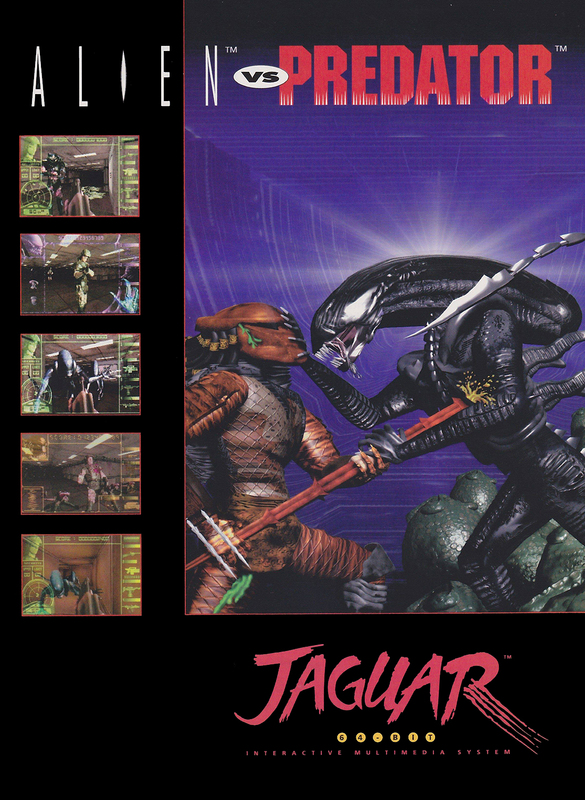 AvP has held up to the scrutiny of time and decades of 3-D gaming improvement,s and deserves to be considered not only one of the best games for the Atari Jaguar, which is sort of a backhanded compliment, but one of the best games of its generation.